The Star Wars gang returns to theaters next week with the release of the franchise’s latest film, “Star Wars: The Last Jedi.” Forty-nine percent of U.S. adults said they plan to see the movie, with 32 percent saying they intend to see it in theaters, according to a new Morning Consult poll. The Dec. 1-4 survey of 2,200 adults, which has a margin of error of plus or minus 2 percentage points, also revealed the Force is stronger with some characters than it is with others — at least when it comes to their favorability. Princess Leia earned the highest favorability, at 73 percent, followed by Luke Skywalker, Chewbacca and Yoda, who all tied for second at 72 percent. R2-D2’s 71-percent favorability is impressive — most impressive — compared to fellow droid C-3PO’s 65 percent and 39 percent for BB-8. 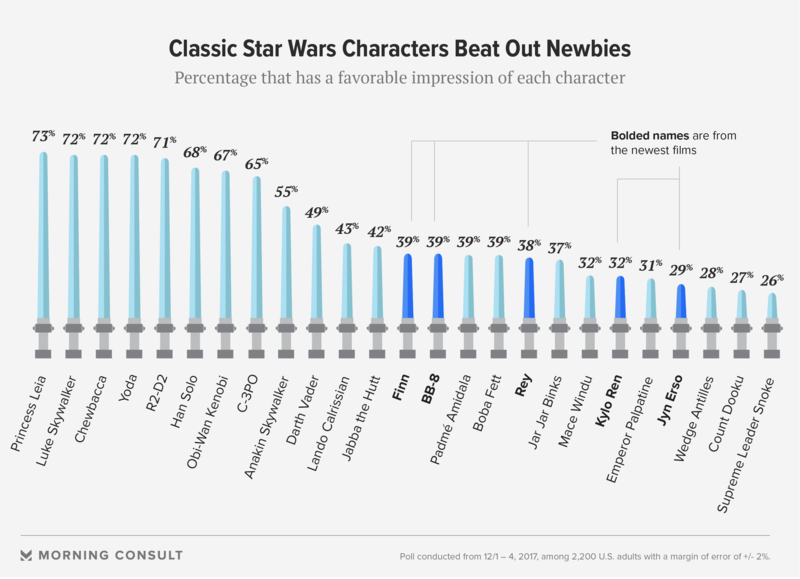 Poll respondents also ranked the original Star Wars trilogy, which starts with “Star Wars: Episode IV A New Hope,” highest in favorability compared with the prequels and more recent films. The newer films — “Star Wars: Episode VII The Force Awakens” and “Rogue One: A Star Wars Story” — are more popular than the prequels. Key to the Star Wars dynasty are adults aged 30-44. Respondents in that category were more likely than any other age group to say they’ve seen each “Star Wars” movie, and they were more likely to say they have purchased a Star Wars-branded product. The Walt Disney Co.’s first film for the franchise, “The Force Awakens,” has brought in more than $936 million since its 2015 release, making it the highest-grossing film in the United States without inflation adjustment. It’s also one of three Star Wars films in the overall top 10 highest domestically grossing films.